GitHub - Cysharp/MicroBatchFramework: Cloud Native Batch Framework for C#. Cloud Native Batch Framework for C#. Want to be notified of new releases in Cysharp/MicroBatchFramework? MicroBatchFramework is an infrastructure of creating CLI(Command-line interface) tools, daemon, and multiple contained batch program. Easy to bind argument to the simple method definition. It built on .NET Generic Host so you can configure Configuration, Logging, DI, etc can load by the standard way. CLI Tools can write by simple method, argument is automatically binded to parameter. // Entrypoint, create from the .NET Core Console App. You can execute command like SampleApp.exe -name "foo" -repeat 5. The Option parser is no longer needed. You can also use the OptionAttribute to describe the parameter. help command shows there detail. -n, -name: name of send user. You can use CommandAttribute to create multi command program. // so you have to pass Context.CancellationToken to async method. MicroBatchFramework allows the multi contained batch. You can write many class, methods and select by first-argument. await BatchHost.CreateDefaultBuilder().RunBatchEngineAsync(args); // don't pass <T>. list command shows all invokable methods. BatchBase(this).Context.CancellationToken is lifecycle token of batch. 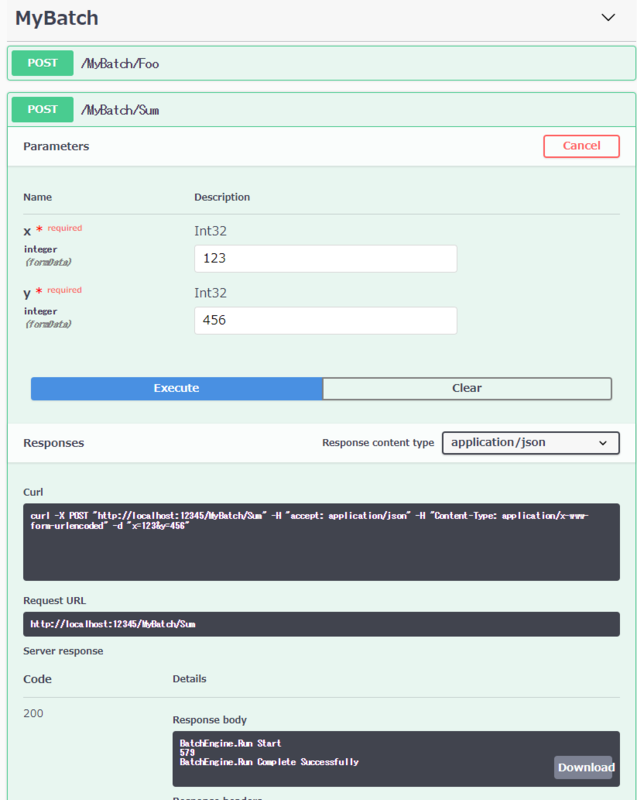 In default, MicroBatchFramework does not abort on received terminate request, you can check CancellationToken.IsCancellationRequested and shutdown gracefully. If use infinite-loop, it becomes daemon program. // you can write infinite-loop while stop request(Ctrl+C or docker terminate). // error occured but continue to run(or terminate). // you can write cleanup code here. Interceptor can hook before/after batch running event. You can imprement IBatchInterceptor for it. BatchContext.Timestamp has start time so if subtraction from now, get elapsed time. In default, MicroBatchFramework does not prevent double startup but if create interceptor, can do. There interceptor can pass to startup. If you want to use multiple interceptor, you can use CompositeBatchInterceptor. MicroBatchFramework is just a infrastructure. You can add appsettings.json or other configs as .NET Core offers via ConfigureAppConfiguration. You can add appsettings.json and appsettings.<env>.json and typesafe load via map config to Class w/IOption. Here's single contained batch with Config loading sample. // get configuration from DI. BatchHost.CreateDefaultBuilder() is similar as WebHost.CreateDefaultBuilder on ASP.NET Core, that setup like below. // set the content root to executing assembly's location. // Load settings from JSON file. // If EnvironmentName is "Development", try to load UserSecrets. // Load settings from Environment variables. // if embeded SimpleConsoleLogger(default is true), setup logging(MinLogLevel's default is Debug). You can use DI(constructor injection) by GenericHost. BatchContext is injected to property on method executing. It has four properties. MicroBatchFramework.WebHosting is support to expose web interface and swagger(with executable api document). It is useful for debugging. in browser http://localhost:12345, launch swagger ui. dotnet publish to create executable file. Here is the sample .config.yml of CircleCI. CLI tool can use .NET Core Global Tools. If you want to create it, check the Global Tools how to create. If you hosting the batch to server, recommend to use container. Add Dockerfile like below. And docker build, send to any container registory. Here is the sample of deploy AWS ECR by CircleCI. and set the AWS_ACCESS_KEY_ID, AWS_SECRET_ACCESS_KEY, AWS_ECR_ACCOUNT_URL, AWS_REGION environment variables on CircleCI. for example, run by AWS Batch, you can host easily and log can view on CloudWatch. If you want to create complex workflow, you can use any worlkflow engine like luigi, Apache Airflow, etc. If you host on AWS Batch, you can use CloudWatch Events to simple event scheduling trigger. If hosting to kubernetes, you can use Kubernetes CronJob.